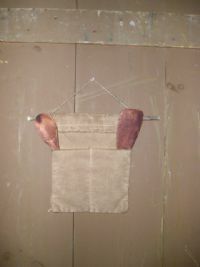 Made from aged osnaburg is this 2 pocket spoon bag. Looks great hanging in your kitchen. Spoons included 10x8. 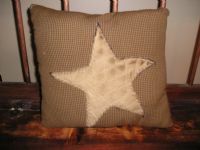 This is new our 12x12 Brown mini check pillow with a grungy quilt star. A must have. 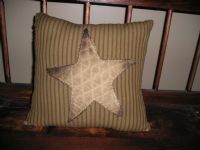 This is new our 12x12 Brown Ticking pillow with grungy quilt star. 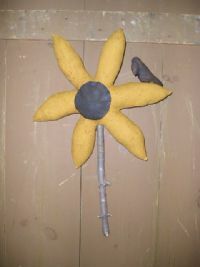 Wonderful for the Summer/Fall is our painted sunflower with black crow. Hook on the back for hanging, Brushed with cinnamon. 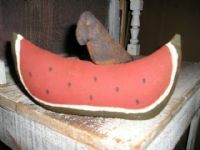 Great addition for the Summertime is our painted watermelon with a grungy black crow that sits on top. Weighed to sit, brushed with cinnamon.